Home People Michigan: A Center for Wind Energy Development? Michigan: A Center for Wind Energy Development? The Motor City could be the North American hub for wind energy. At least, that’s the goal of a new partnership between a pair of design, engineering, and testing companies in metro Detroit. 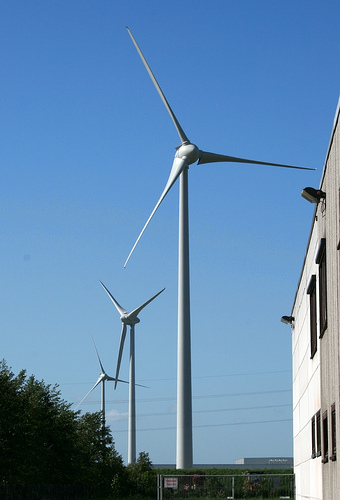 Ricardo, Inc. in Van Buren Township and LMS International in Troy announced in late May that they have combined their wind energy expertise with the launch of the North American Wind Energy Development and Innovation Center. The Center is an umbrella organization where equipment suppliers, government agencies, utilities, and other renewable-energy stakeholders can tap Ricardo and LMS’ technical and facilities expertise. Services will include design and engineering expertise, software-based modeling and simulation, and testing of components and equipment in a lab or out in the field. “What we want to see is Michigan be engineering leaders in the wind industry,” says Marc Wiseman, Ricardo’s vice president of clean energy. But competition is on the rise. Steve Bisel, director of marketing and communications at LMS, says wind energy companies are cropping up in Denver, Massachusetts, and Clemson, where the U.S. Department of Energy is seeking to build a large wind turbine drive train testing facility. To set themselves apart, Ricardo and LMS will outsource their engineers to wind energy companies with the hopes that some will set up facilities in southeastern Michigan. David Young, LMS’ general manager, says the partnership is confident outside companies will locate here, especially given the state’s mandate that local utilities produce 10 percent of their overall energy from renewable sources by 2015. “It makes sense for us to do this,” Young says. Kent Niederhofer, Ricardo’s president, says it could take several months before the partnership reaches its full potential. “It is difficult to predict at the moment what the nature and rate of growth is, but there is no question that it will be significant,” Niederhofer says. The average life span of a modern wind turbine is 20 years, with a warranty period of two years. As it stands, wind turbines are prone to fail within six years. While working to improve quality and extend longevity, Ricardo and LMS are working to reduce noise pollution caused by turbines, which has been an issue in Europe. The two companies have deep experience in addressing design challenges, and are working to set up training programs to assist engineers who may have lost their jobs due to the sluggish economy and cutbacks within the automotive industry. One goal of the partnership is to provide clients with the skill set to tackle future projects on their own. As for the partnership’s probable success, Niederhofer points to the Obama Administration’s goal of delivering 20 percent wind energy by 2030. “If we are to achieve anywhere near the Obama administration’s (expectations) by 2030, the Innovation Center has singular capacity in great demand over the next several years,” he says.